Vitamin B5 is part of the family of B-complex vitamins. Also called Pantothenic Acid, this one vitamin is used by literally all of the functions the body performs. Vitamin B5 is a water soluble vitamin and it's one that's in abundant supply. How does this all-important vitamin benefit the body? To begin with, like the other members of the B-complex family, Vitamin B5 has a major role in the metabolism process that converts carbohydrates, fats and proteins into energy. That alone is a lot. In addition, Pantothenic Acid acts as an adrenal gland stimulant. As the glands are stimulated, the production of adrenal hormones, and especially cortisone, increases. The vitamin is also believed to be capable of reducing fatigue and thereby enhancing stamina levels. Pantothenic Acid is crucial for the production of antibodies too. Many specialists agree that Vitamin B5 can help the body fight off the symptoms of stress, anxiety and even depression. Vitamin B5 helps to lower bad cholesterol levels and that helps reduce the risks involved with heart disease. It can help prevent arthritis or if it is already present Pantothenic Acid can help to alleviate the symptoms of this painful condition. Hormone production depends on a steady supply of Vitamin B5 and so does the creation of healthy red blood cells and hemoglobin. Healthy skin and hair both are possible because of this important B vitamin. In fact, Pantothenic Acid has been used to treat acne and rosacea. It helps wounds heal faster. And finally, this powerhouse can help slow the aging process. Surprisingly, fruits are not a reliable source of Vitamin B5. Pantothenic Acid is found in almost all other unprocessed foods. The best sources of this vitamin are eggs, yeast, poultry, meat, fish, liver, milk, sunflower seeds, soya beans and bean flour, peas, peanuts, peanut butter, legumes, broccoli, collard greens, bananas, oranges, mushrooms, whole grain products and wheat germ. One thing that should be noted about Pantothenic Acid is that it breaks down easily in heat. Care must be taken during food preparation. Since this vitamin is present in many different foods, it is rare that people do not get enough from their diets. Therefore, guidelines as to recommended daily intake of Vitamin B5 don't exist. For most adults, 4 - 7 mg/day is sufficient. Getting as much as 10 mg/day or more isn't a problem since this vitamin is water soluble. What the body doesn't use will simply be eliminated via the urine. 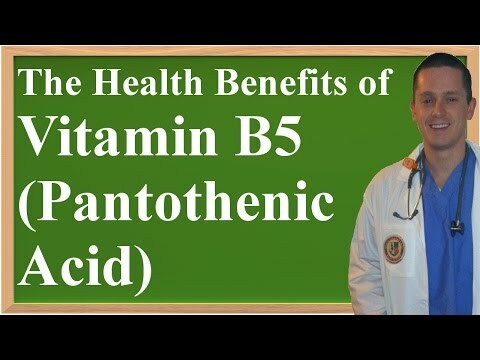 In the unlikely event of a Vitamin B5 deficiency, those affected may have the following symptoms: overall weakness, muscle cramping, insomnia and fatigue, intestinal problems such as water retention, nausea, vomiting or diarrhea, a low resistance to infection or a tingling sensation in the extremities. Note that these symptoms can indicate a deficiency in one of the other B vitamins. Since it is rare to have a Vitamin B5 deficiency, it may be necessary to investigate the likelihood that another vitamin deficiency is causing these symptoms.